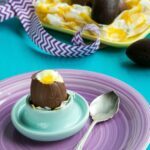 These Easter Cheesecake Chocolate Eggs make an egg-straordinary dessert that is sure to wow your friends this Easter! Fun and super easy to make with kids! To make the eggs, melt 2/3 of the chocolate in a heatproof bowl over a pan of simmering water. Once melted, remove from the heat and mix in the remaining chocolate chips. With the help of a brush spread the chocolate around each egg mould. If you spread it too thinly, you may need to brush them twice. Freeze for about 5 mins, then gently pop the shells out of their moulds. Meanwhile, prepare the cheesecake filling. In a large bowl mix together ricotta, orange juice and zest, vanilla and sugar. Mix until smooth and creamy and refrigerate until ready to use. Fill each shell with a little cheesecake filling and pour 1/2 tsp of passion fruit pulp in the center. Use any leftover melted chocolate to brush the edges of each filled shell, then glue two half-shells together. Freeze for about 5 mins, then serve. Store leftover eggs in the fridge for up to 3 days.